While most of the Tampa Bay Buccaneers used their bye week to get away from work and relax, Jameis Winston stayed closer to home and continued to prepare for his first start in nearly 10 months. TAMPA, Fla. (AP) — While most of the Tampa Bay Buccaneers used their bye week to get away from work and relax, Jameis Winston stayed closer to home and continued to prepare for his first start in nearly 10 months. The No. 1 overall pick from the 2015 draft missed the first three games of the season while serving a suspension for violating the NFL’s personal conduct policy. Winston came off the bench for the second half of a 48-10 loss to the Chicago Bears two weeks ago. On Sunday, he resumes his role as Tampa Bay’s starting quarterback against struggling NFC South rival Atlanta. The fourth-year pro said Thursday he’s both grateful to be back and eager to help the Bucs improve on a 2-2 start. “I’m thankful I had the support of my teammates and the (organization) throughout the suspension,” said Winston, who was disciplined by the league following an investigation of an accusation that he groped a female Uber driver in Arizona in 2016. Winston is taking the reins of the NFL’s top passing attack and No. 2-ranked offense overall, thanks to a record-breaking performance by veteran backup Ryan Fitzpatrick. Fitzpatrick, who’s played for seven teams during a 14-year career, became the first player in league history to top 400 yards passing in three consecutive games. 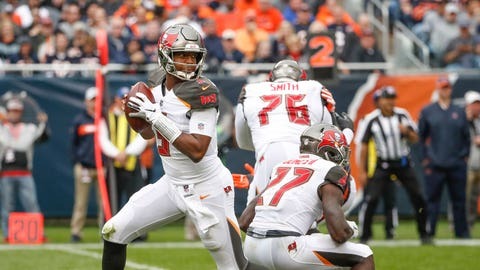 The Bucs opened with upsets of New Orleans and Super Bowl champion Philadelphia, then were outscored 68-13 in the first half of losses to the Pittsburgh Steelers and Bears, who led 38-3 when Fitzpatrick was benched. Winston was 16 of 20 for 145 yards, one touchdown and two interceptions in the second half at Chicago. Sunday’s start will be his first since Dec. 31, when his 39-yard TD pass to Chris Godwin on Tampa Bay’s final offensive play of last season gave the Bucs a 31-24 upset of the Saints. The Bucs were encouraged by the way Winston played after sitting out three games with a shoulder injury last fall. One of the knocks on the 24-year-old has been his lack of accuracy on deep throws. However, coach Dirk Koetter and offensive coordinator Todd Monken said Winston has made strides since returning from the injury that hindered him most of 2017. “The thing on that is Jameis’ shoulder was worse than we thought it was for a longer period than we thought,” Koetter said. While teammates scattered for the bye week, Winston chose to spend the six-day break doing individual work and getting acclimated to his normal routine. Now that he’s back, Winston and the Bucs don’t see any reason the team shouldn’t continue to be explosive offensively with Winston throwing to a talented group of receivers that includes Mike Evans, DeSean Jackson, Adam Humphries and Godwin, as well as tight ends O.J. Howard and Cameron Brate. “I’m very confident about that. We have some great (playmakers),” Winston said.